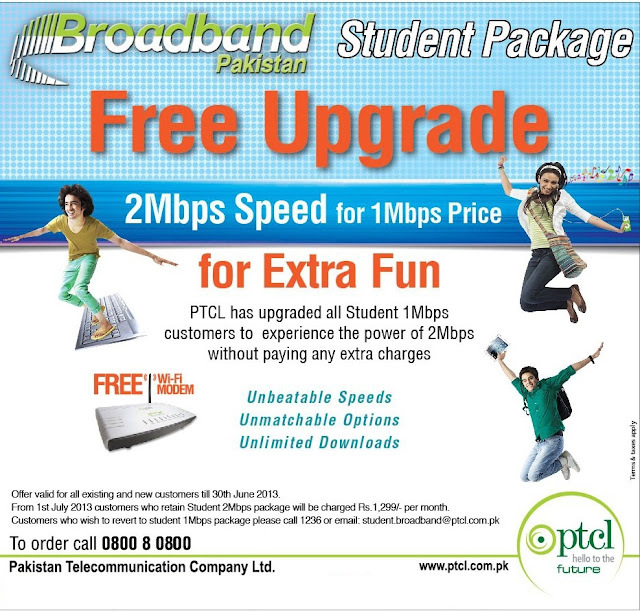 PTCL has once again upgrades DSL 1-Mbps student package to 2-Mbps. Continuing with the tradition of offering special promotions and to generate excitement among existing and potential PTCL customers, PTCL is launching a special promotion for all existing and new broadband subscribers. This promotion offers 2 Mbps broadband for the price of Rs. 1,099 per month. Customers can enjoy 2 Mbps speed at the price of 1 Mbps Student Package till 30th June 2013. From 1st July 2013 standard Student 2 Mbps tariff of Rs. 1,299 per month will be applicable.